Just when it looked like things may be turning around for the Eagles with a road win at the Jets and a seemingly benign date with Washington up next on the schedule, Chip Kelly's squad took another hit in the loss column. Philly paid a visit to the Redskins on Sunday and lost 23-20. Speaking of three-point losses in Week 4, both the Steelers and Jaguars were doomed by kicking woes. Philadelphia Eagles . Winning at the Jets is nothing to scoff at, but a small step forward led to a giant step back for Philadelphia. The 'Skins, who were also a mediocre 1-2 on the season, did not give up a single first-half point to the Eagles before the home team held on for crucial victory. Adding insult to injury, running back DeMarco Murray has finally started griping about the lack of touches he is getting. The day almost got even worse for Philadelphia when Dallas forced overtime at New Orleans, almost making it a clean sweep of wins for the other three NFC East competitors (the Giants won 24-10 at Buffalo). But the Saints ultimately prevailed 26-20, keeping the Eagles just a game out of first place in the division. Philly is a -4.5 home favorite over the Saints in Week 5. Josh Scobee and Jason Myers . Even with Michael Vick in for Ben Roethlisberger, it was all right there for Pittsburgh to win at home last Thursday night and all but eliminate AFC North rival Baltimore. Scobee had not one but two chances late in the fourth quarter to put the Steelers ahead by six points. Instead, he botched both field goals, the Ravens tied it to force overtime, and won it with another field goal of their own. Thus Baltimore is 1-3 instead of 0-4 and still in the division picture. Three days later in another division battle, Jacksonville was one field goal away-twice-from pulling off a road upset of Indianapolis. Myers missed with the game tied at the end of regulation, got another try because the Colts had called timeout, and missed again. He overcorrected (wide left instead of wide right) from five yards closer (48) in overtime and Indy promptly won with a field goal of its own. The Steelers are +700 to win the AFC North and the Colts are -500 to win the AFC South. Georgia and Georgia Tech . It was another great weekend for the NFL team in the state of Georgia, as the Atlanta Falcons improved to 4-0 with a bang. At the college level, however, the blues are being sung. Georgia suffered its first loss of the season and did so in alarming fashion. The Bulldogs trailed Alabama 24-3 at halftime and 38-3 early in the third quarter on their way to a humiliating 38-10 home setback. Georgia Tech's implosion came in the second half. The Yellow Jackets led North Carolina 21-0 at one point only to squander the entire lead in front of their home fans en route to a 38-31 loss. Tech has dropped three in a row and is 0-2 in the ACC. Georgia is a -3 favorite at Tennessee this weekend. Charlie Strong . When losing 50-7 isn't the worst thing your football program did on a given day, you know you've got problems. On its way to an embarrassing 43-point loss to TCU, Texas trailed 37-0 at halftime. That's when freshman cornerback Kris Boyd actually had the audacity to retweet a tweet made by a Texas A&M fan suggesting that he transfer to the Aggies. "They should never be on their phone at halftime" is what Strong had to say about his players. In his second season, Strong's Longhorns are 1-4 and two of their four setbacks (the other to Notre Dame) have come by a combined score of 88-10. Texas is a +16 underdog against Oklahoma on Saturday. Anaheim Angels . 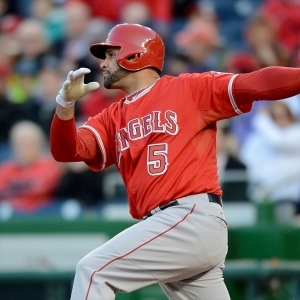 The Angels made a miraculous comeback in game No. 161 to keep their season alive. Less than 24 hours later, however, game No. 162 proved to be the end of the road. Anaheim had scored five runs in the ninth to pull off a stunning 11-10 win at Texas this past Saturday. On Sunday, though, Mike Trout and company got clobbered 9-2 by the Rangers to finish one game behind Houston for the second American League wild card. Texas is +1200 to win the World Series; Toronto is a +300 favorite. Jimmie Johnson . Sitting fifth in the Sprint Cup standings with one race left in the first round of the Chase, Johnson seemed like a lock to advance. Moreover, he was already a 10-time champion at Dover International Speedway-site of Sunday's AAA 400. But it went all wrong for the No. 48 car, which suffered a rear axle seal failure and finished 37 laps off the pace in 41st position. That sent Johnson plummeting to No. 14 in the standings, one of four drivers eliminated behind the 12 qualifiers. At the other end of the spectrum, Kevin Harvick pretty much had to win in Dover in order to advance following disastrous finishes at the first two events in the Chase. And that's exactly what Harvick did. Brendan Rodgers . It was a good weekend to be a Rodgers on the Green Bay Packers; not so much if you were the Rodgers who is-or was-the manager of Liverpool. The decision to sack Rodgers was reportedly made before Sunday's English Premier League match against Everton and nothing was done to change the mind of team executives. A 1-1 draw left Liverpool in 10th place on the EPL table with a 3-2-3 record. The Reds collapsed late in the 2013-14 to throw away a chance at the title before stumbling to a sixth-place finish last season, 25 points behind Chelsea. Manchester City is a -140 favorite to win the Premier League.